This ice-cream is a great treat without being overindulgent. If you love chocolate ice-creams these have chocolate ice cream and chocolate coating without being too chovolatey or indulgent. 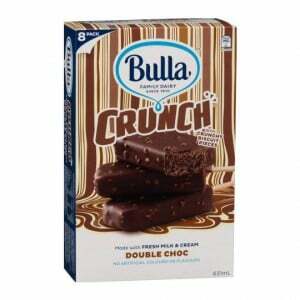 The Bulla Crunch double choc ice blocks are so yummy and have that yummy choc flavor. These are always my first choice when i go shopping. They are definitely for the Chocolate lovers. Bulla delivers delicious ice cream products with a price that is good for our budget. Bulla crunch ice cream double choc delivers a double dose of choc delight. Who doesnt like a chocolate treat! Bulla’s double choc ice creams, are tasty, with nice creamy ice cream, kids loved them great arvo treat or after dinner dessert. My children and I absolutely love these ice creams, delicious ice cream… my only change I’d make is making the chocolate coating a little thicker…. but I’m a chocolate lover! Too much chocolate for my liking, the outside crunchy shell being chocolate and the whole inside is chocolate too. I thought it might be ok to eat double chocolate but it was a bit too much for me. With the warmer weather coming, these delicious Bulla Crunch Ice Cream Double Choc make their way back into my freezer. Everyone loves them, the double choc is so yum! Extra chocolately. The inside is very smooth and decadent and the outside is smooth and crunch chocolate. Nice for kids and adults. Bulla Crunch Ice Cream Double Chocolate are delicious treats for after school or on the weekends. A very nice taste and texture and best of all they are great value for money. Bulla double chocolate crunch is a great ice-cream for chocolate lovers, it is a great price that is affordable and delicious on a hot day. You can’t go wrong with Double Choc at my place; everyone likes it! Bulla has a great range of ice cream flavours and there is always something for everyone, but choc is liked by all. I buy these on a regular basis and they don’t cost a lot, but are really cheap when on special. The crunchy bits in the chocolate outer are nice and the chocolate and the icecream are yum as well. These are the perfect thing to eat when I’ve finished my exercise and I’m relaxing watching TV. They taste really good and don’t sit too heavy so are great as a naughty snack. We purchased a bunch of different Bulla ice creams, as the were on special at our local supermarket for only $3 per box. This was one flavour that we most likely won’t be purchasing again, as the majority of us, didn’t really like it. The Chocolate on chocolate was a bit sickely and we much prefer the ones with a different flavour on the inside. How would you rate Bulla Crunch Ice Cream Double Choc?